Today at a press event in San Fransisco, Samsung announced the Galaxy S10 series of phones which all ship with the recently rebranded Samsung One UI. 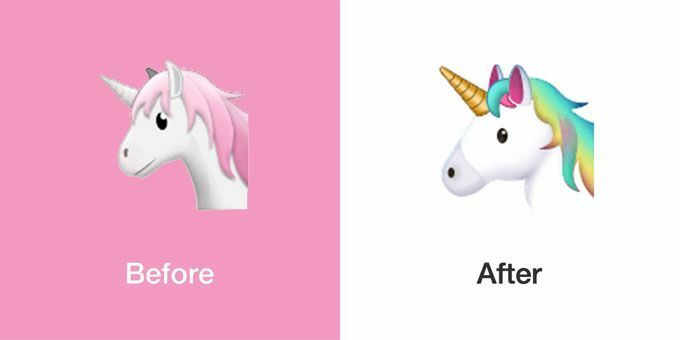 This custom Android implementation changes a considerable number of emoji designs, and shows new emojis from 2018 on the keyboard for the first time. Above: A selection of revised emoji designs included in Samsung One UI. As with previous Samsung emoji updates, a number of emoji changes made in Samsung One UI appear to have been made in the name of greater cross-platform convergence in design. 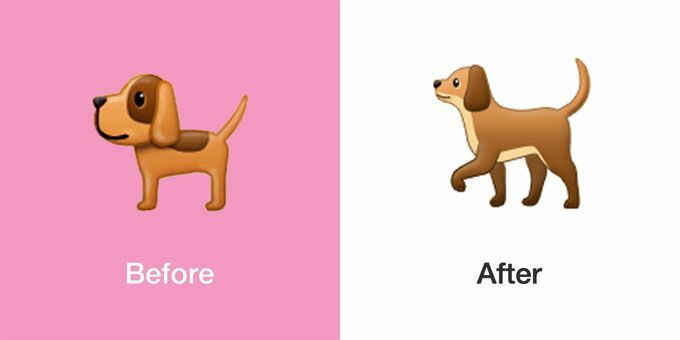 Almost all of the animal emojis have been updated, with most now being depicted more realistically. Take 🐘 Elephant, for example. 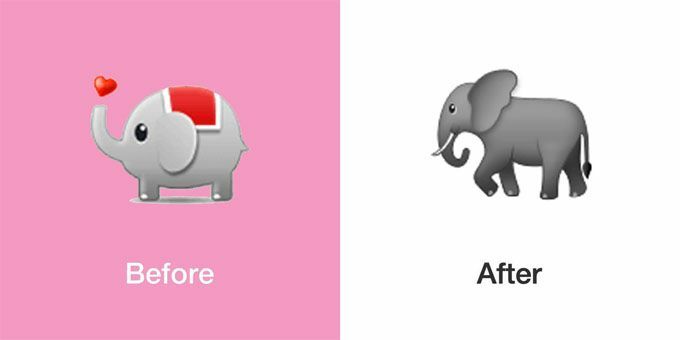 Above: 🐘 Elephant as displayed within Samsung Experience 9.5 and Samsung One UI 1.0. This is the first Samsung update to be released the under the "Samsung One UI" moniker. Previous versions of Samsung's custom Android implementation were branded as "Samsung Experience" (and before that, Samsung TouchWiz UI, with the last update to emoji designs coming in Samsung Experience 9.5. As previewed in December of last year, Samsung One UI has re-introduced a selection of emoji previously made unavailable on Samsung devices in an August 2016 update: ✝️ Latin Cross, ☪️ Star and Crescent and ‼️ Double Exclamation Mark. 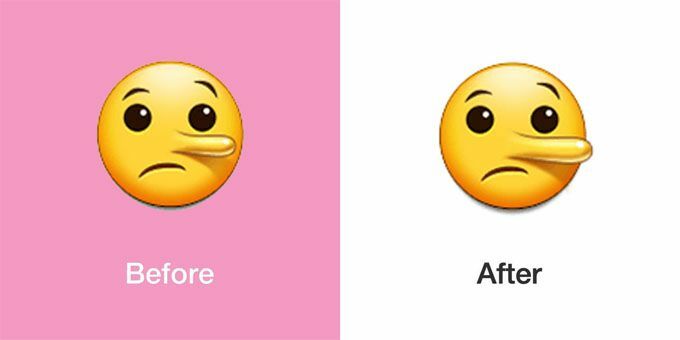 Above: Three emojis removed from Samsung devices in a 2016 software update and re-introduced in Samsung One UI. Also returning to emoji support with this update are ©️ Copyright and ®️ Registered. 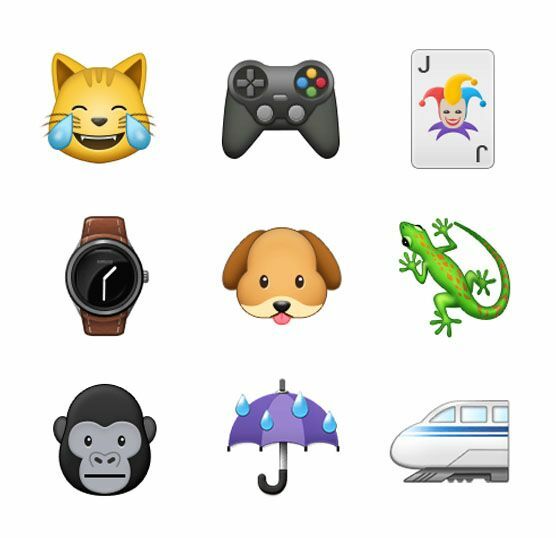 Gone now are the final remnants of a long-standing Samsung emoji quirk: letters (usually two or three letter initials) marked on a variety of objects. 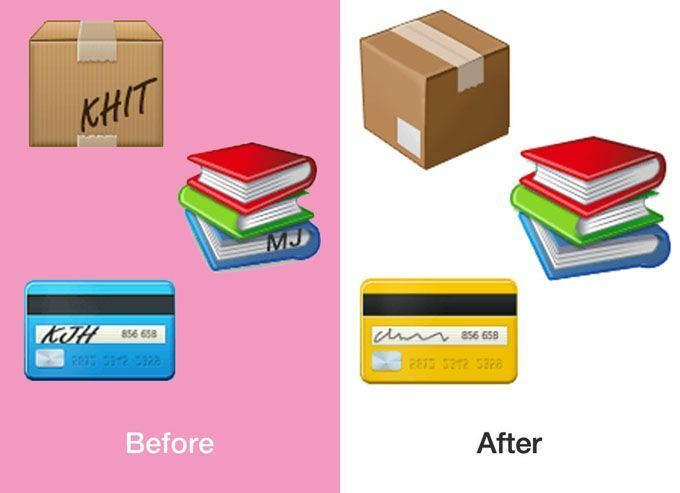 Such initials were removed from 📛 Name Badge, 📓 Notebook, 📒 Ledger and 🏷️ Label in the last Samsung emoji update, but they have now also been removed from the likes of 💳 Credit Card, 📕 Closed Book, 📦 Package and 🚅 Bullet Train. 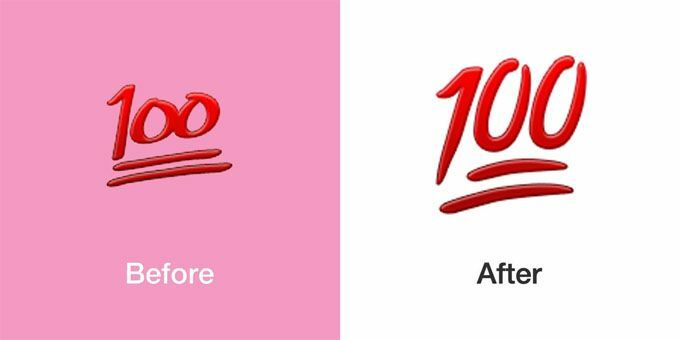 Emoji 11.0 support was introduced in August 2018 but failed to add any of the new emojis to the Samsung keyboard. As such, users could not enter any new emoji unless using a third party keyboard, or copying and pasting from the web. Above: The new Samsung keyboard (right) compared to the previous layout (left). Photos: Jeremy Burge. One UI does finally make the new emojis available for input from the built-in Samsung keyboard. Interestingly, the keyboard also now shows all emojis notably larger (on the keyboard) than in previous releases. 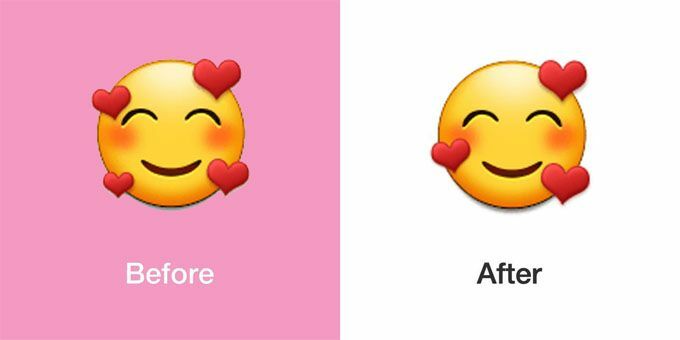 🥰 Smiling Face With Hearts now displays three hearts floating above the face instead of four. 🤥 Lying Face now has a longer nose. 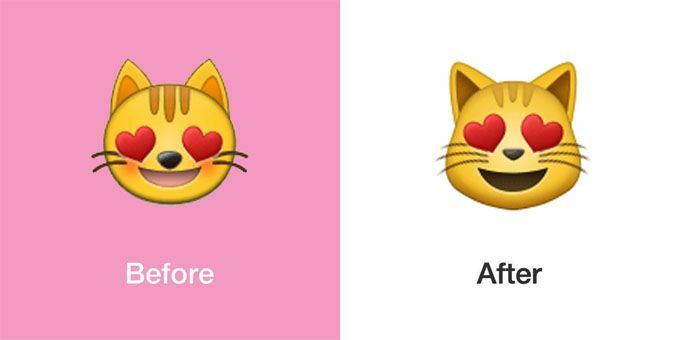 😻 Smiling Cat Face With Heart-Eyes now includes a more natural face shape, replacing the previous circular face. 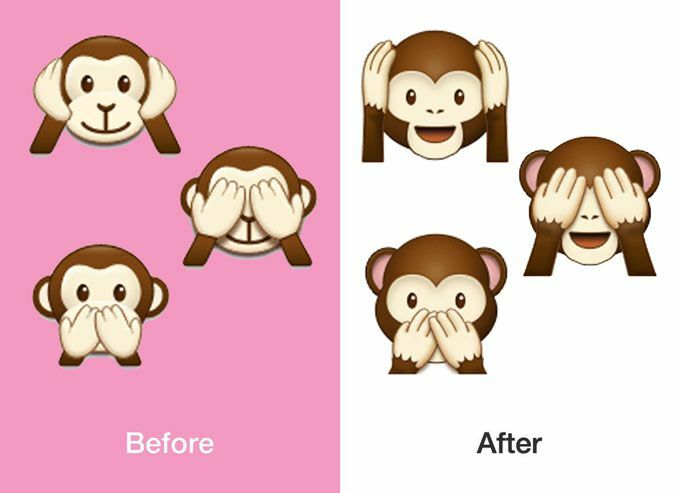 🙈 See-No-Evil Monkey, 🙉 Hear-No-Evil Monkey and 🙊 Speak-No-Evil Monkey redesigns hands and faces. 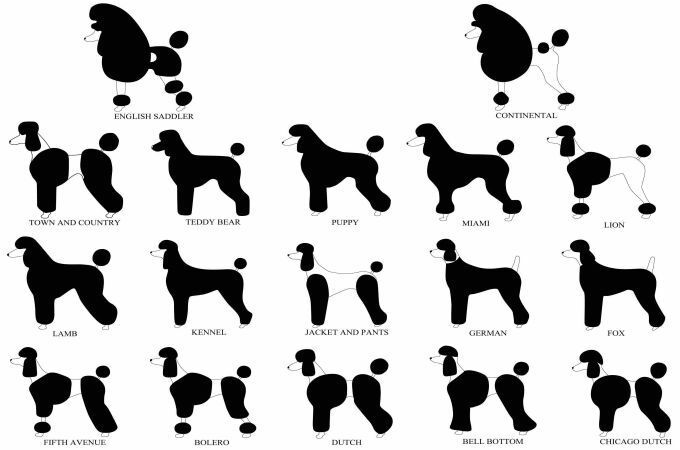 🐕 Dog now has more realistic proportions and all four legs are now visible. May also be a different breed. 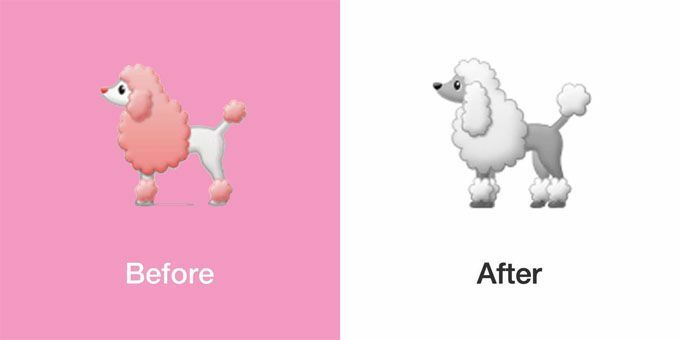 🐩 Poodle has its modified continential fur changed from a pastel pink to a more natural white/grey and nose is now black instead of pink. 🦄 Unicorn Face now features a more detailed muzzle as well a bigger horn, larger ears and a multi-colored mane of hair. 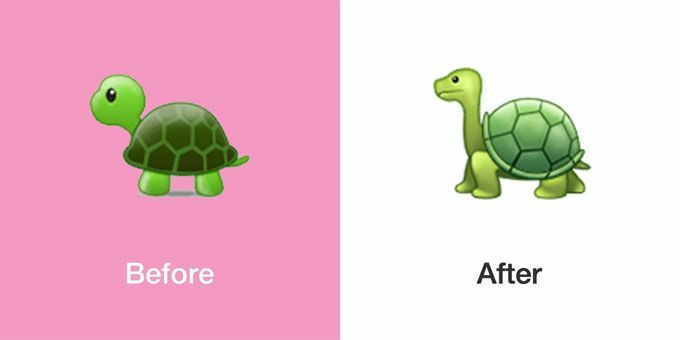 🐢 Turtle has been updated to include a mouth, as well as a longer neck and is now showing all four of its legs. 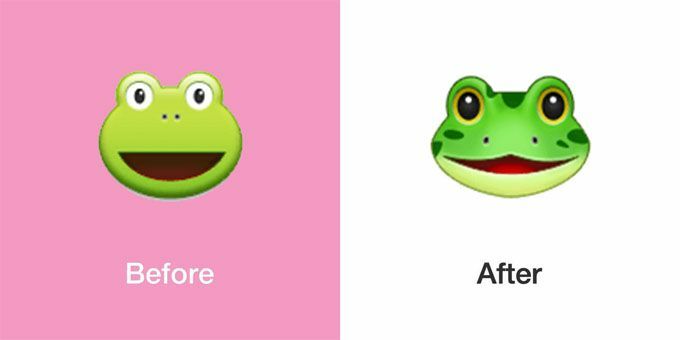 🐸 Frog Face now features distinctive markings on its cheeks and the crown of its head. 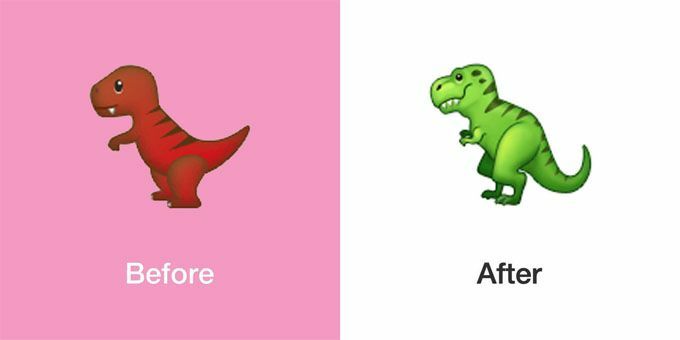 🦖 T-Rex is now green and features a re-shaped head and limbs, leading to a less cute and more cinematic appearance. 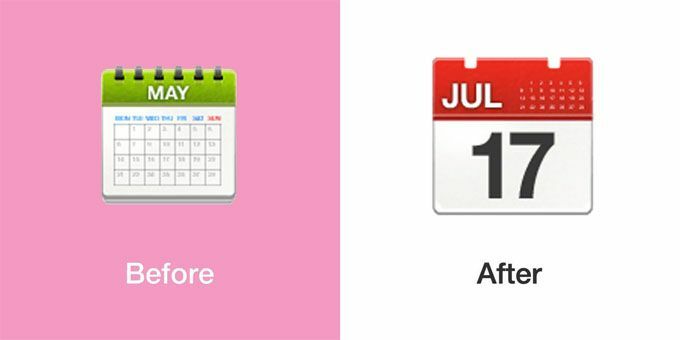 📅 Calendar now displays the date as July 17, the date of World Emoji Day. 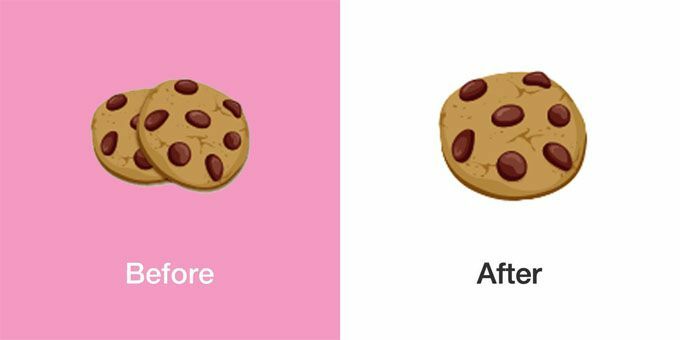 🍪 Cookie now displays a single chocolate chip cookie instead of two. 💯 Hundred Points now has a handwriting style more similar to other vendors. 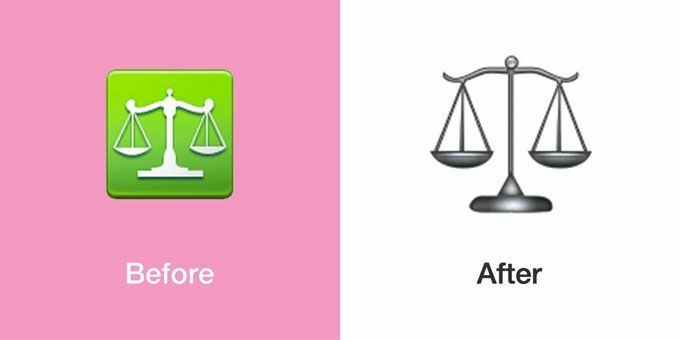 ⚖️ Balance Scale now appears as an actual object, as opposed to a white symbol on a square green background. 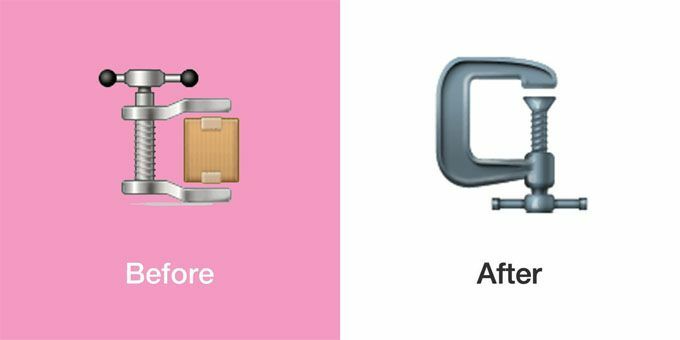 🗜️ Clamp has been re-designed as a C-clamp and no longer displays a small cardboard box in its vice grips. 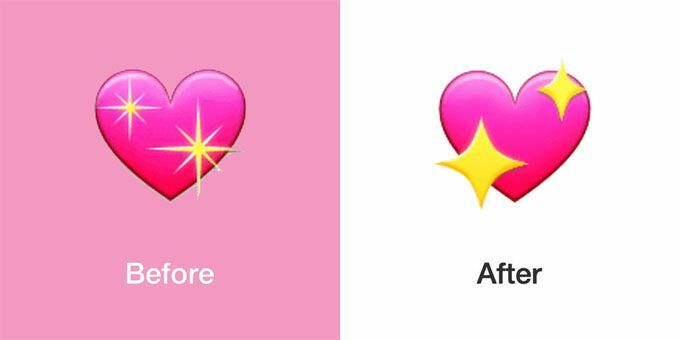 💖 Sparkling Heart now has inverted the placement of its two stars, with these stars now featuring four points instead of eight. A very close match to Apple's design. 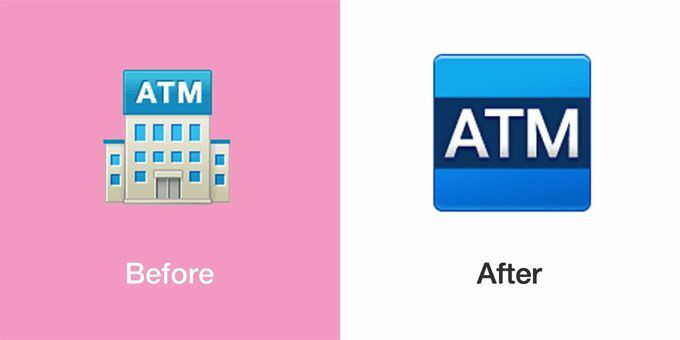 🏧 ATM Sign now displays as a symbol instead of a building, as per other vendors. The various 👯 People With Bunny Ears emojis continue to display a single bunny-eared person instead of two matching individuals. Many vendors used to display a single person for this emoji, but now Samsung remains the last major holdout using this style. Above: 👯 People With Bunny Ears as it is displayed across a series of major vendors' emoji sets. Since Samsung TouchWiz 7.1 in 2016, 🇺 Regional Indicator Symbol Letter U displays a capital "V" (instead of U) and 🇻 Regional Indicator Symbol Letter V displays a "U" (instead of V). The incorrect switch of 🇺 Regional Indicator Symbol Letter U and 🇻 Regional Indicator Symbol Letter V remains unchanged in this update. 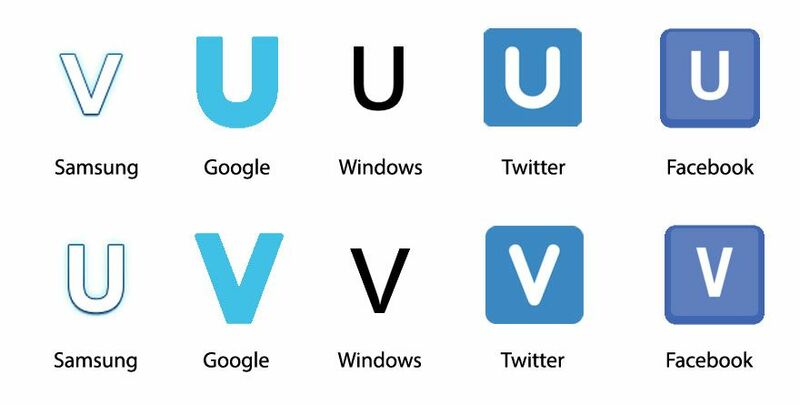 Above: 🇺 Regional Indicator Symbol Letter U and 🇻 Regional Indicator Symbol Letter V as they are displayed across a series of major vendors' emoji sets. As regional indicator letters are not intended be displayed in isolation (they are intended solely for the creation of flag emojis) this design mis-match isn't of major consequence to most users, but is an odd bug to last for so many years. The 👁️‍🗨️ Eye in Speech Bubble emoji has also not included in this update, having been removed from Samsung's emoji as of 2018. While Samsung One UI has been rolling out to certain Samsung devices as early as December 2018, today marks the release of the Samsung Galaxy S10 which is the first device to run Samsung One UI as its default OS upon release. As is the norm with Samsung updates, rollout of One UI 1.0 to additional Samsung devices is expected to take place over the coming weeks and months, though its availability will vary by location, device and mobile phone carrier and many devices will not get updated at all. Users are advised to get in touch with Samsung or their carrier to see if or when they plan to support this update on their own device.